When an organization or business suddenly finds itself in the middle of a civil litigation case, it is often overwhelmed with discovery requests. Most companies don’t have the tools or processes in place to deal with collection and data preservation and encounter expensive and time-consuming issues when responding to requests for information. What is a legal hold, would your organization be able to initiate a defensible legal hold, and when can data be confidently deleted again? It is very important to understand the discovery process and implement and enforce effective systems for data preservation now in order to reduce future costs of potential litigation. 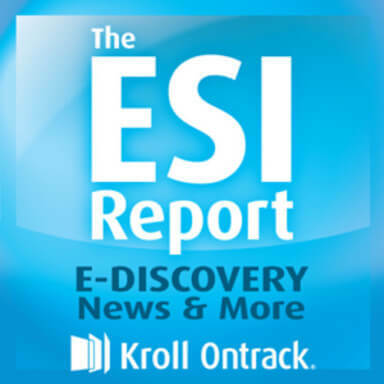 In this episode of ESI Report, Michelle Lang interviews experienced e-discovery expert Cathleen Peterson about why data preservation is crucial to the discovery process, how to create a defensible legal hold, how to take account for emerging technologies, and when it is ok to delete data. Peterson explains that the fundamental challenge of data preservation is balancing the burden and the benefit. Failure to preserve means trying to recreate access to the data, an incredibly expensive and time-consuming process that raises questions about the effectiveness of the council or credibility of the client. Alternatively, well-preserved data can facilitate a well-managed litigation, control costs, result in an outcome that serves the client, and create the least disruptive litigation flow. A legal hold, Peterson explains, involves giving all potential parties who may have relevant evidence notice that litigation is in existence or anticipated. This includes employees, third parties, the IT department, or any person who may have accessed the information. She discusses how organizations need to implement a data governance system, enforce it across the organization, and update it yearly to account for changes in technology. Once the case is dismissed, the legal hold should be formally lifted and the data deleted so that future cases are not complicated by old data. Peterson is a senior vice president at Kroll Ontrack, where she leads the consulting and advanced review services teams. She was the Legal Director at Orrick, Herrington & Sutcliffe and councel at WilmerHale. Cathleen has deep experience in all-things ediscovery, including records management, collection and preservation strategies, technology assisted review, and regulatory compliance.